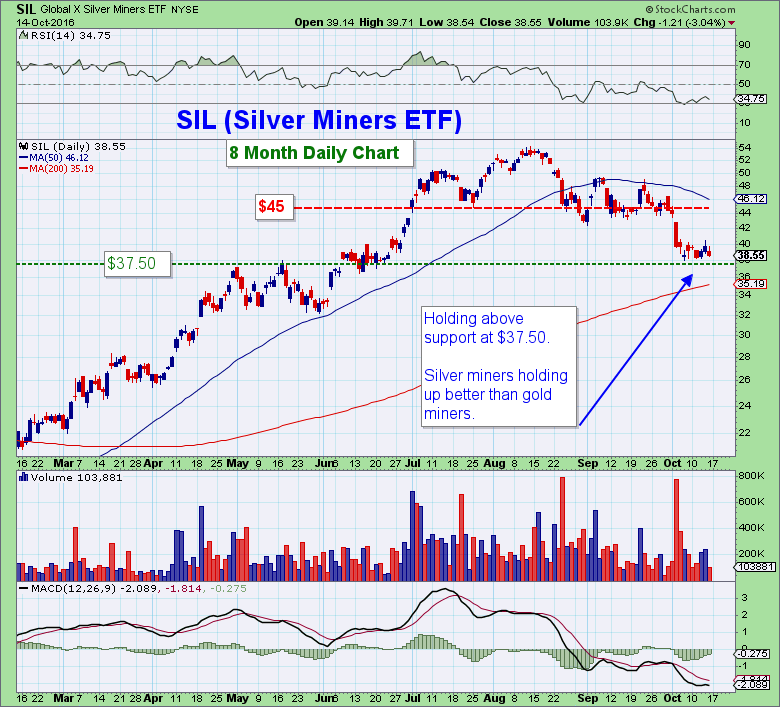 Welcome to Follow the Money’s Weekly Metals Report for the week of October 16th! The final months of 2016 could begin to bear close resemblance to the closing months of 2015. You may recall that from Oct-Dec 2015, gold bounced along its lows between $1040 and $1100/oz in anticipation of the first rate hike in years. The stock market was trading sideways near all-time highs. When the measly 0.25% rate hike finally came to fruition in December 2015, it turned out to be a “buy the rumor, sell the news” event that marked the bottom for the metals and a top for the S&P 500. 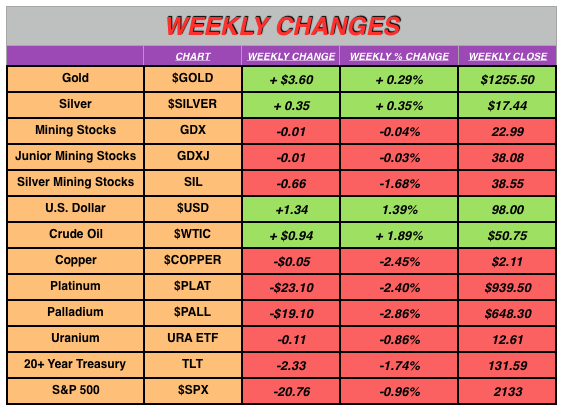 After the December 2015 hike, 2016 began with a powerful rally across the precious metals complex, while the S&P printed the worst Q1 on record. In my estimation, it’s unlikely that the Fed will raise rates in November just prior to the election, but a December rate increase appears increasingly probable. That would set the stage for a potential replay of last year. If the market continues to anticipate Fed action in December, look for the metals to churn sideways for a couple of more months before the uptrend resumes. With reported earnings down some 20% from the peak of eight quarters prior, the fundamental case for a significant stock market correction is well grounded. That said, if price and volume do not confirm the above scenario, I will respond accordingly to the market signals given. Regarding all of the drama and intrigue surrounding the presidential election, it should be noted that unless the immutable laws of basic arithmetic are somehow altered, neither candidate will mend our economic woes. The fact that we’re fast approaching a point where the sum of defense military spending and interest payments will combine to consume 100% of Federal tax receipts illustrates that point. Unless the fundamental issue of a private banking cartel lending currency into existence -with interest- is addressed, political bluster about solving our looming debt and currency crisis is exactly that- bluster. 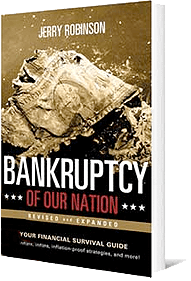 No carefully crafted concoction of tax, monetary, or fiscal policy can square the books in a paradigm of more debt and liabilities outstanding than currency in circulation. Under the current debt-based monetary system, meeting future obligations requires more currency creation, and thereby more debt. I’m not sure either candidate can even spell the word “fiat,” let alone possess the acumen or integrity to formulate a plan to return to a system of honest weights and measures. Got Gold? 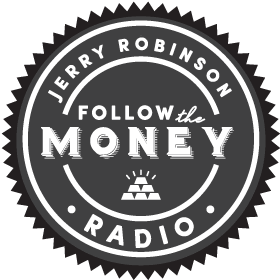 **FTM is still offering a generous Fall promotion where the first month of membership is just $1, and no commitment after that. 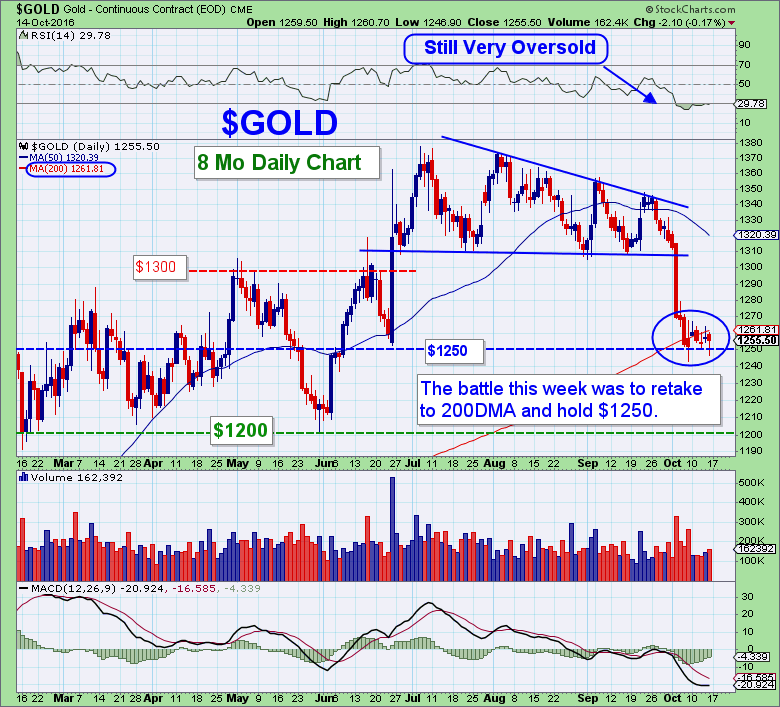 Gold traded sideways this week, consolidating just above the $1250 level and just below the 200DMA. The position trend (weekly chart) remains down. 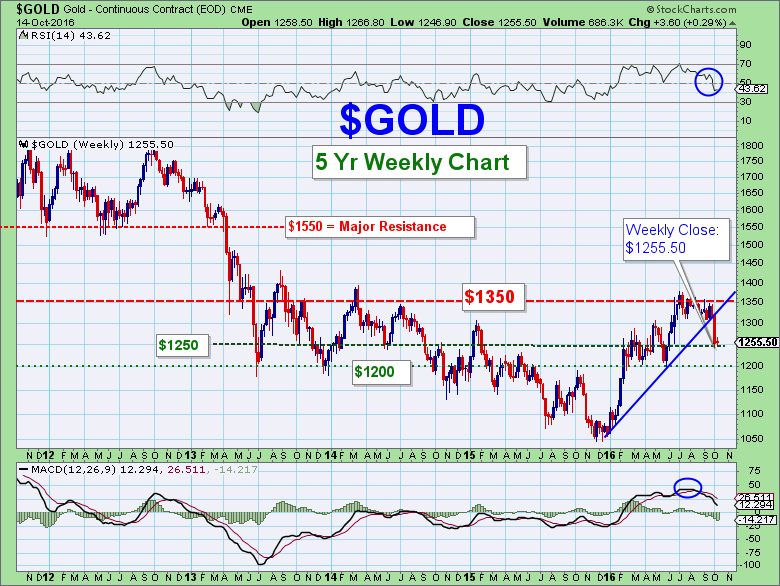 Gold is deeply oversold on its daily chart, perched just above key support at $1250 and due for a bounce. Watch the volume on any bounce, as a rally back to $1300-$1308 on low volume would likely indicate normal profit-taking of the shorts “ringing the register” after the recent rapid decline. For a sustained rally to new highs, we’ll need to see institutional money re-enter this market. Big money tends to avoid anything trading below its 200DMA and in a clear downtrend. For the trend to reverse, I believe we’ll either need a major catalyst or time for the technical damage to be repaired. In the meantime, let’s see if one of the reversal chart patterns that Jerry has been covering develops in the coming weeks. While I do expect sideways consolidation, the threat of another sharp down leg remains a possibility and caution is warranted. The position trader may be well served by building cash until we see resistance cleared on high volume and a buy signal given in Trigger Trade Pro. 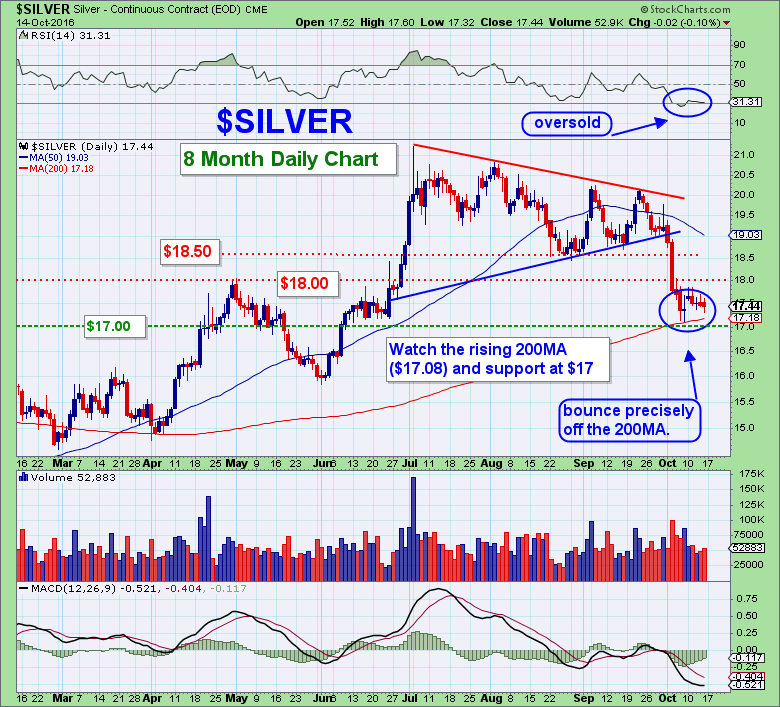 Like gold, silver is sandwiched between a rising 200DMA and the key $17.50 level. I’m expecting price to churn sideways for a few weeks, but the threat of another selloff lingers as a possibility. Clearing $18.50 on big volume will provide the sign that a sustained rally may be ready to resume. On the downside, watch the rising 200DMA, currently $17.18. 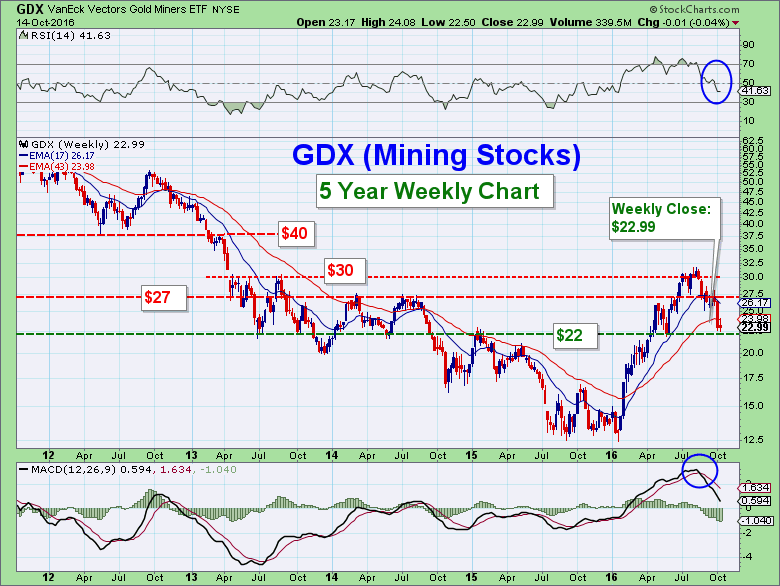 The levels to watch on GDX are the rising 200DMA ($22.35) and horizontal support at $22. 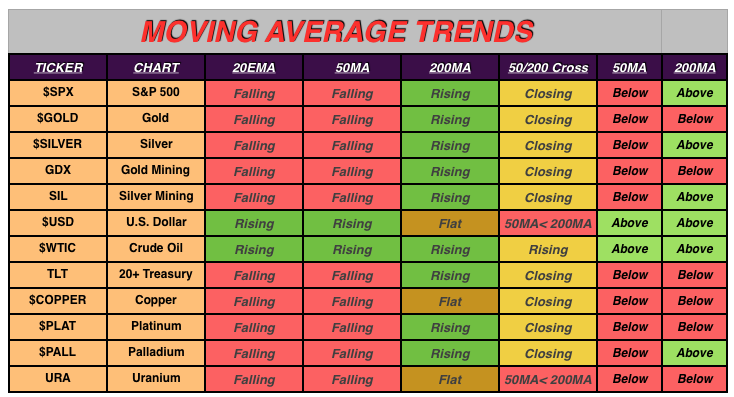 MACD and RSI on the daily chart indicate that momentum is trying to reverse, but buying now may prove to be a bit premature. Profit Trakker is also yet to give a buy signal. If you’re aggressive, don’t mind the added risk and buy early, you may consider a stop just below support at $22. In gold, the Commercial net short position declined/improved by a very large 50,043 contracts. In silver, the Commercial net short position declined by a big 13,261 contracts. *See the large decrease in the vertical blue bar, which represents the combined commercial net short positions. JP Morgan is by far the largest short in the COMEX silver market. They also happen to be the custodian of the SLV ETF. Hmmm. While there has been a marked improvement over the preceding two weeks, the commercial banks remain positioned with historically large bets on lower metals prices. Lower prices remain in the banksters’ best interests, although it may prove difficult for them to engender significantly lower prices from here. I’m hoping they are able to gradually unwind their short positions as price grinds sideways over the coming weeks. 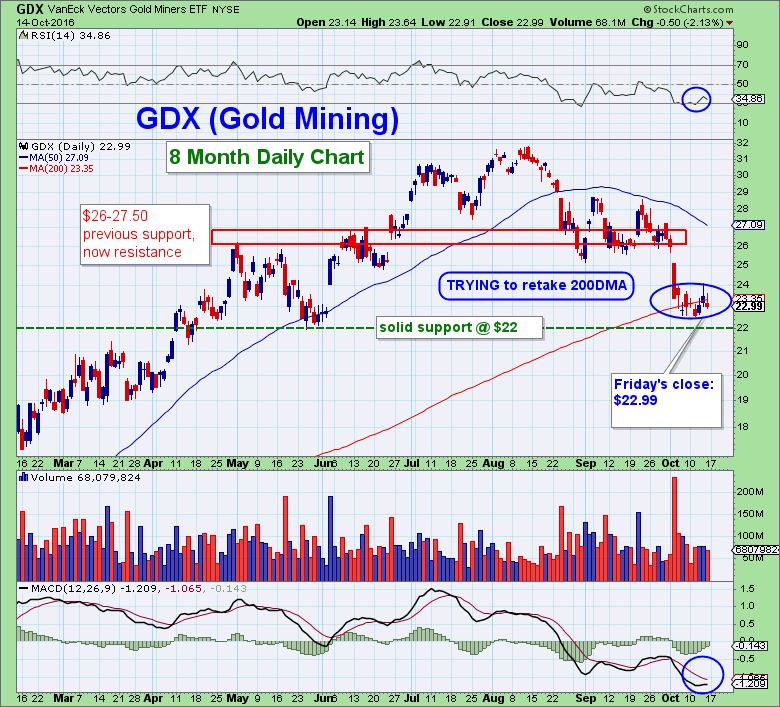 The charts indicate that the metals and miners are attempting to base near these levels. However, we remain susceptible to another quick decline should nearby support and the 200DMAs give way on large volume. The CoT, though improving, is a lingering concern and worth monitoring. Sometimes it’s prudent to simply wait for the market to give more clarity, and this appears to be just such an occasion. In the meantime, I’ll be using the weakness in the paper markets to dollar-cost-average into physical metal.